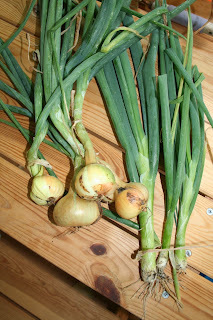 Sew Can Do: Harvest Time In Our Organic Garden! Harvest Time In Our Organic Garden! 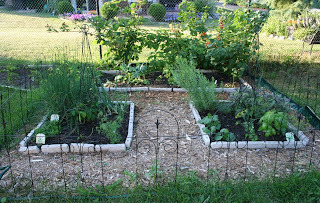 Over the weekend we decided to see how our root vegetables fared this summer. This was the first time we'd ever grown carrots & onions. Growing from seed and organically kept my expectations pretty low, so i was thrilled to see these little guys! 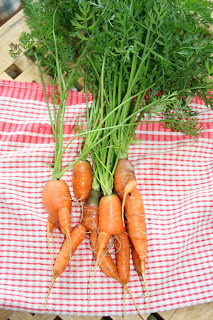 Not having grown carrots before, I think the "two-legged" ones look really strange, but we'll try them tonight and see. We used some of the bulb onions already and they turned out really well and I'm amazed how teeny tiny seeds produced such thick green onions. Our broccoli & tomatoes are finally coming around, so baring any dinnertime visits from our infamous woodchuck (who treated our cucumbers & herbs like his own personal salad bar a few weeks back), we should have those in the coming week or two. I'm deceptively including a pic I took a few weeks ago when our garden was neat and tidy. It now resembles a jungle with all the tomato plants, giant herbs & random weeds I haven't pulled, but it looked nice at one time. Luckily the tasty things coming from it help make up for it's less than picturesque appearance these days! Great job farming. I have not had a garden in years. I really need to try my hand at it next year. I love the little plots you did. Hope your supper is great!! Those onions were really mild and very tasty. That's definitely worth doing again.